Self-esteem hypnosis means using hypnosis as a method of attaining improved self-esteem. Hypnosis is often used as a method of attaining goals that the conscious mind may be resisting. It is entering a trancelike state that allows you to be open to suggestions, such as improved self-esteem. Low self-esteem refers to a person’s low opinion of themselves, and is often not based in reality. You may think you are not smart enough or attractive enough or that you are not as good as other people. You may also think other people are thinking about you in a negative way even when they’re not. Thinking in a negative way about yourself is a habit, and habits can be difficult to break. It may seem that negative tapes are playing in your head telling you that you’re not good enough and no matter how hard you try, you can’t seem to turn them off. One thing that is commonly recommended is positive thinking. The habit of negative thinking needs to be replaced with a habit of positive thinking. That is easier said than done, because a lot of the negative tapes playing in your head are deeply rooted in your subconscious, and can’t be corrected just on the conscious level. The subconscious has to be reached somehow through methods such as daydreaming, visualization and hypnosis. Self-esteem hypnosis can replace those negative inner tapes with healthier thoughts. Hypnosis does its magic by leading the person into a highly relaxed state. It is similar to the deeply relaxed state a person attains just before falling asleep. In this highly relaxed state, messages of high self-worth and inner value can be introduced to the subconscious mind. In fact, the brain can be dramatically transformed using subconscious methods such as this. It is a way of learning to harness the power of your own mind. Reaching the subconscious mind is also important because you may be unaware of dialog that is going on at a subconscious level. You know that you don’t quite believe in your own value and worth, but you are not conscious of self-bashing on a conscious level. But what is your subconscious mind saying? An example of something that may be happening on a subconscious level that you don’t even realize is fear of success. If you find yourself continually unable to succeed, but you are not aware of constantly negative self-talk on a conscious level, you may have a deep-rooted fear of success on a subconscious level. This can be conquered using tools that reach the subconscious mind such as hypnotism. Self-esteem hypnosis can be attained by consulting a personal hypnotist. 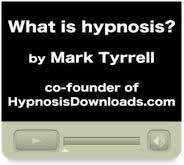 It can also be attained by using self-hypnosis MP3’s or CD’s. With these tools you can free yourself of fears and negativity and other unresolved issues. You can finally meet your potential. If you find that you can’t seem to conquer your negative inner self-talk, give hypnosis a try. This is a powerful tool that can truly change your life.